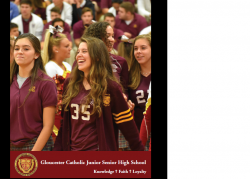 Gloucester Catholic Junior Senior High School will implement a Head of School/Principal model of leadership that will present a new approach to administrative authority and responsibility. This new model of leadership is designed to help Gloucester Catholic adapt to the needs of the 21st Century Catholic School. The Head of School will devote his energies to strategic planning, development and fundraising. The Principal will become the academic leader, responsible for the management of our school. Bishop Dennis Sullivan has appointed Mr. John Colman as Gloucester Catholic’s Head of School, effective July 1, 2013. Mr. Colman previously served as Gloucester Catholic’s first lay Principal from 1999 through 2013, overseeing a period of steady growth and academic advancement. Mr. Colman holds a BS from Mount Saint Mary’s College in Maryland and an MEd. in education from Holy Family University. As a teacher, department chair, athletic director, vice principal and principal, he has served the Gloucester Catholic family for over 40 years. Bishop Sullivan has also appointed Mr. Edward Beckett as the new Principal, effective August 15. Mr. Beckett has served the school as Assistant Principal for Spiritual Formation for the past 8 years. He holds a BA in History from Rutgers University, an MA in Philosophy from Saint Louis University, and an M.Div from Weston Jesuit School of Theology. He also earned an M.Phil from Trinity College in Dublin. Mr. Beckett has an MA in Educational Leadership, Management, and Policy from Seton Hall University and a New Jersey Principal’s Certificate. An alumnus of the Gloucester Catholic Class of 1978, he previously taught at St. Joseph’s Preparatory School and served as an administrator at Boston College High School.